For dressing: Whisk together all ingredients well. Chill until serving. Store in refrigerator for up to 2 weeks, shake or whisk prior to serving. (It may store longer than this, but it never stays around long enough without being eaten for me to know!). For the salad:. 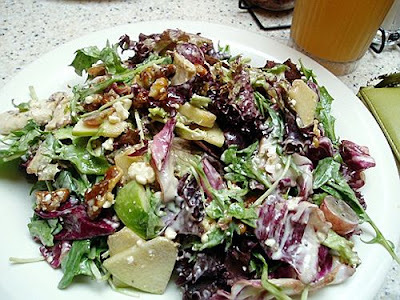 Toss field greens, fruits and celery, if included, in desired amount of dressing. Place evenly divided portions on two large, chilled plates. Top with sliced, chilled chicken breast, candied walnuts, and Gorgonzola.